I’m sure that most of you are way more organized than me and already have your meals planned down to the last detail. But just in case you’re running a little behind (like me! ), or for those of you who may be looking for a healthier stuffing recipe (like me! ), or, ahem, might not even be a huge fan of traditional stuffing (like me! 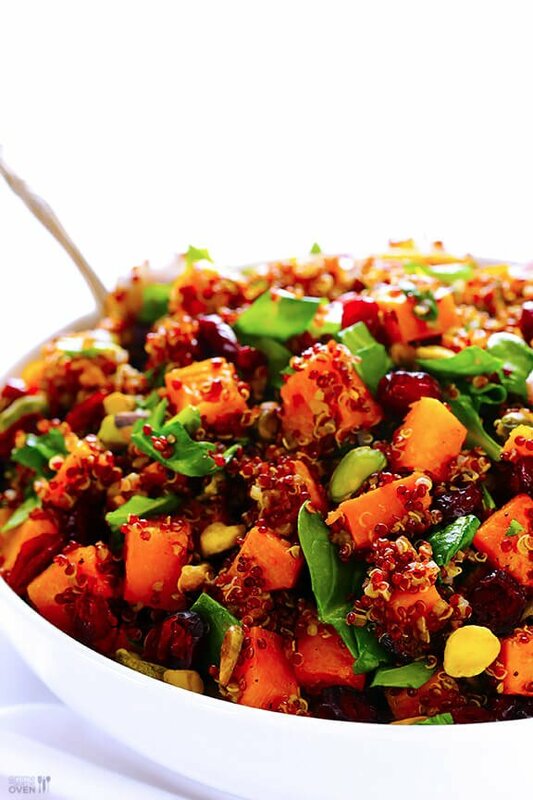 ), I have a last-minute winner of a recipe for you — Butternut Quinoa Stuffing. Actually, there’s no “stuffing” involved with this tasty dish, as it is cooked 100% outside of the bird. It’s technically more of a “dressing”, if anything. 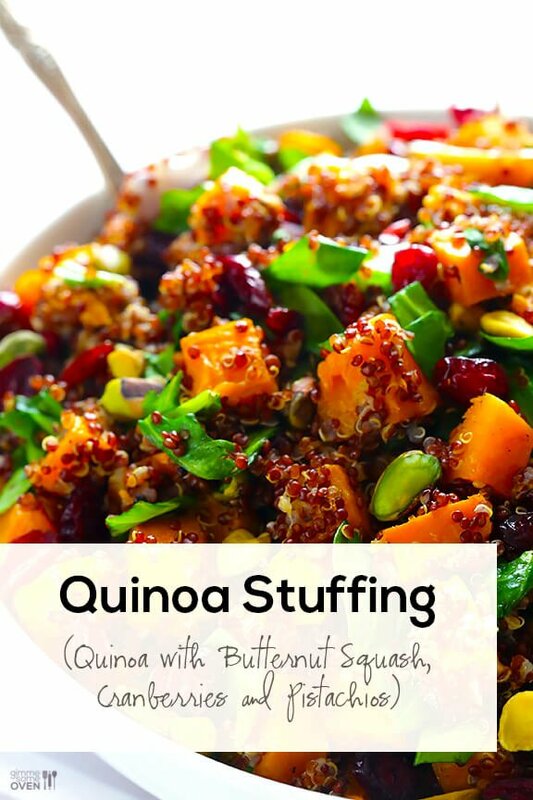 But whatever you call it, this healthy and fabulously delicious quinoa is filled with so many of my favorite stuffing ingredients — roasted butternut squash, pistachios, cranberries, spinach, red onions, and more. 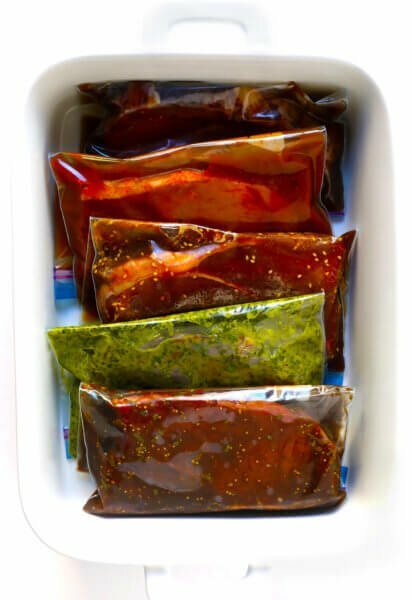 And it can be ready to go in about 45 minutes, with only 15 minutes of prep time. And it’s gluten free. And vegetarian. And vegan. So basically just about anyone at your Thanksgiving meal can happily dive in. Did I convince you yet?? Ok, let’s talk about how easy it is to prepare. Here are all of the ingredients you need. Fresh, very healthy, and scrumptious. 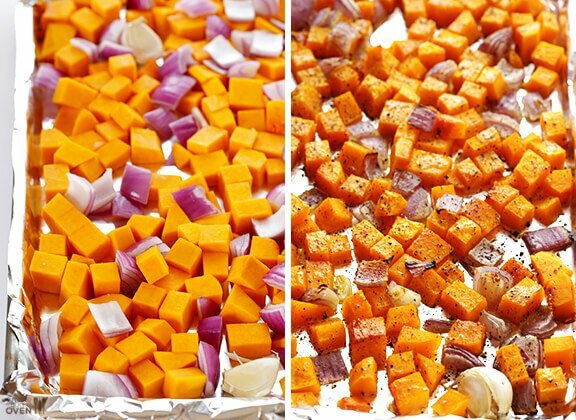 Simply chop up a butternut squash and a red onion. Toss them with some cloves of garlic in olive oil, season with salt and pepper, and roast them until they are nice and cooked. Your home is going to smell a-mazing. Then chop up a bunch of fresh spinach (or any greens — kale, arugula, etc. 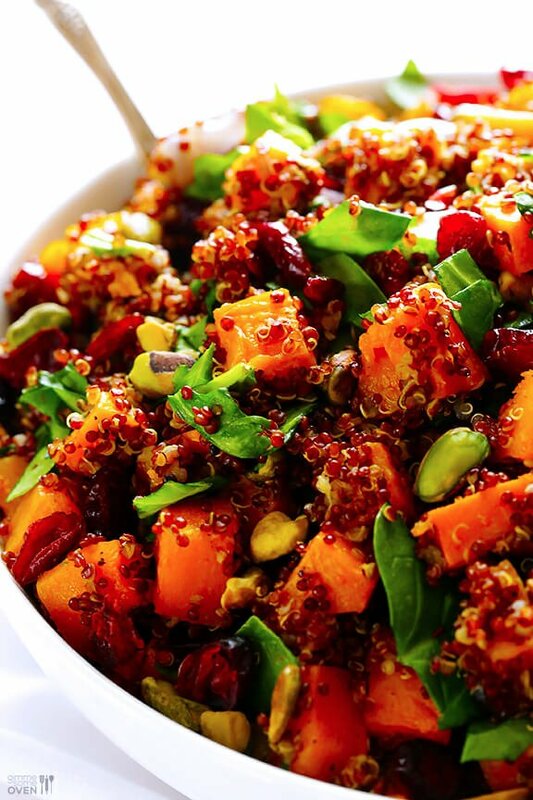 ), and toss it with the roasted veggies, cooked quinoa, pistachios and cranberries. Then season with extra salt and pepper if need be. And people — that’s it! I told you it was easy! And holy moly, is it tasty. 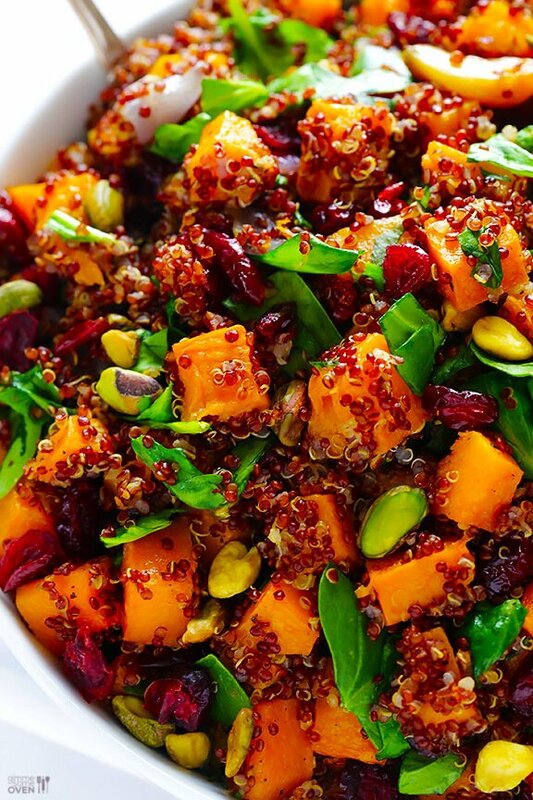 Quinoa is naturally packed with protein. 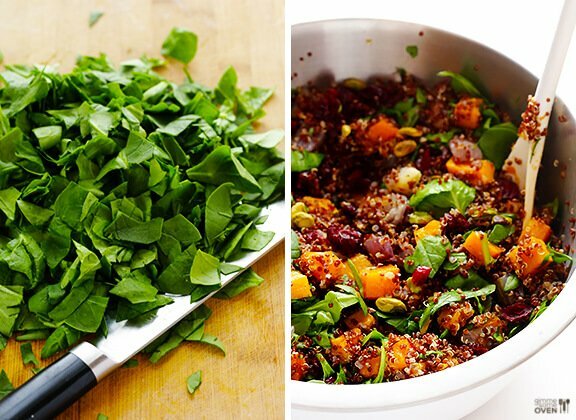 But add in all of those pistachios, fresh spinach, squash, and even the dried cranberries, and lemme assure you — you won’t need to feel guilty going back for seconds of this fresh stuffing. So, so, so much healthier than its traditional counterpart. 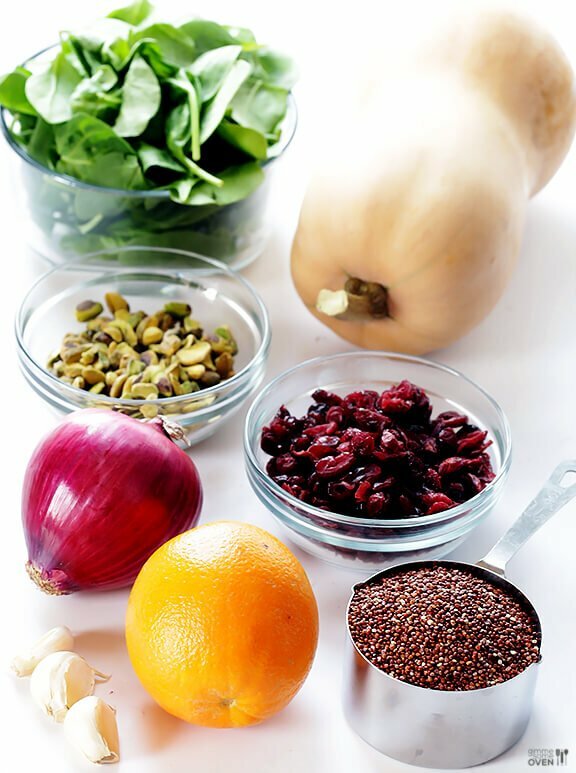 Perfect for Thanksgiving, or any other day of the year you are looking for a delicious and healthy meal. Enjoy! This delicious quinoa stuffing is packed with healthy ingredients and is full of amazing flavor! In a large mixing bowl, toss butternut squash, onion, and garlic cloves (with peel still on) until they are evenly coated with oil. Spread then out in an even layer on the prepared baking sheet. Season generously with salt and pepper. Roast for 30 minutes, or until soft and cooked and the edges begin to slightly brown. Remove and set aside. Discard the garlic peels. Meanwhile, stir together quinoa, broth (or water), and orange zest, and cook according to package instructions. 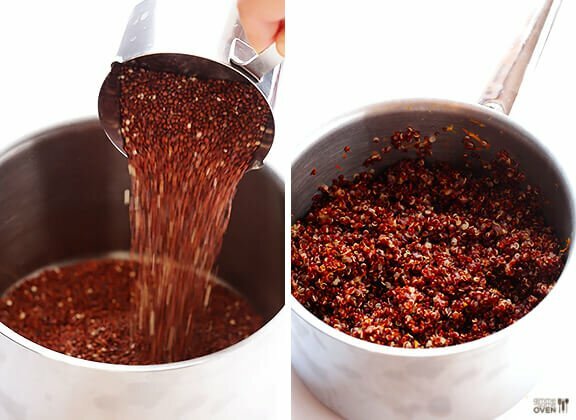 (Or you can follow my tutorial for how to cook quinoa http://www.gimmesomeoven.com/how-to-cook-quinoa-recipe/). When cooked, set aside. 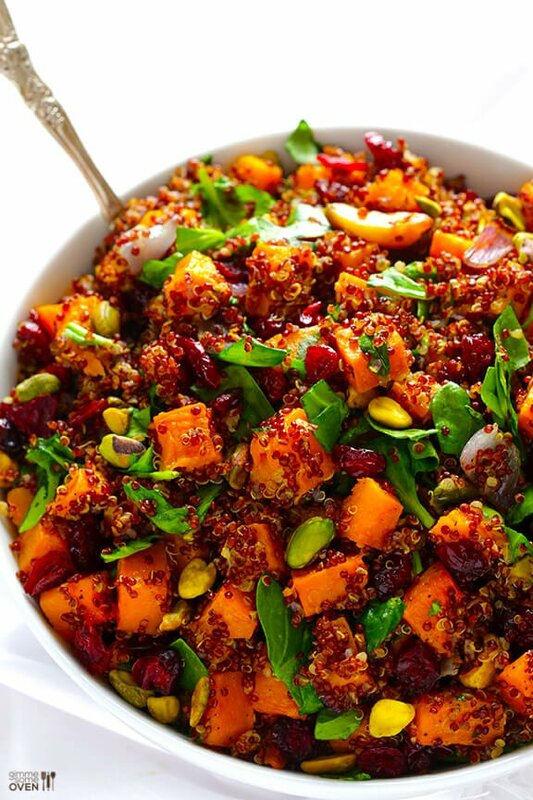 Add the cooked veggies, quinoa, spinach, cranberries and pistachios to a large mixing bowl, and gently toss to combine. Season with additional salt and pepper if need be. Serve warm. Recipe inspired by With Style And Grace http://withstyleandgraceblog.com/2011/11/16/quinoa-sweet-potato-and-dried-cranberry-stuffing-thanksgiving/. 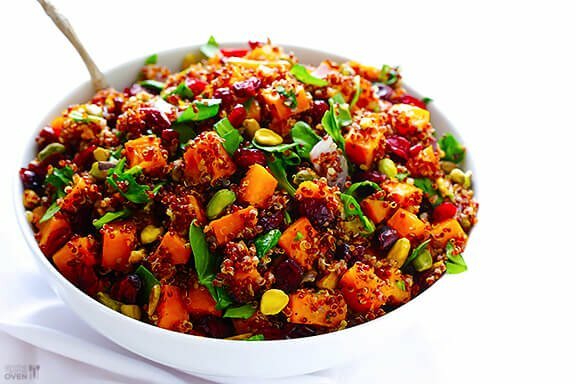 My friend Lisa has an amazing quinoa stuffing version there with sweet potatoes — be sure to check it out! OMG! This is so worth every minute it took to make. All the yummy favors attack the taste buds from all directions. 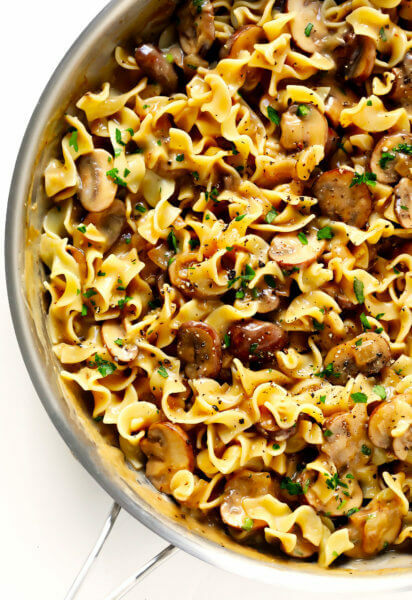 One suggestion I would give is to leave making this dish until fairly close to meal time (like within an hour). Thank you and Happy Thanksgiving!! Thank you Diana, that’s so sweet of you! We’re happy you enjoyed this, and we appreciate your suggestion as well! We hope you had a great Thanksgiving! My significant other is allergic to pistachios. What could I substitute for those? Hi Yvonne, you can just leave the pistachios out or replace them with any other nut you like. We hope you enjoy! 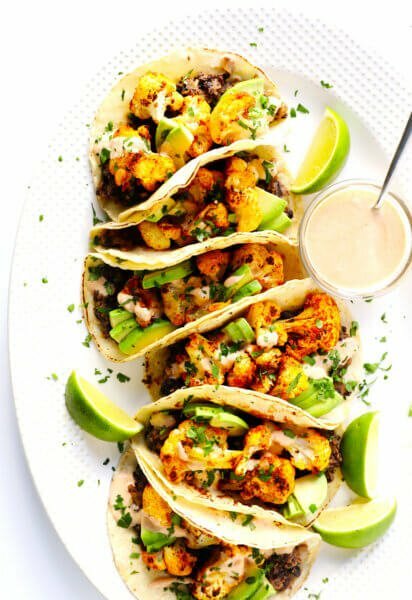 This is one of my favourite recipes of all time!! A twist that I really like to do is use jalapeno pistachios.